Use Webro CCTV cables to get the most from your CCTV system. 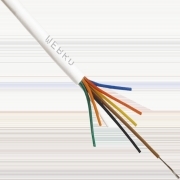 Webro’s range of composite CCTV cables are suitable for use on camera signal, data & control systems. Most of our range is available for next-day delivery, and includes: Circular or shotgun style Coaxial + Power constructions, with either an RG59 or URM70 coaxial cable and either 0.50mm2, 0.75mm2 or 1.50mm2 power cores. Circular or shotgun style Coaxial + Data constructions with a URM70 coaxial cable + multipair data. Other options are available on request.